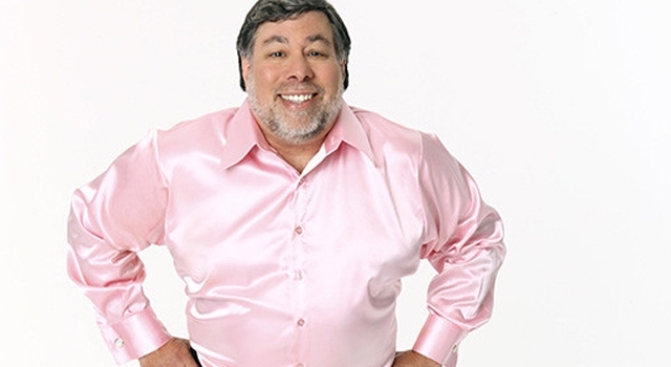 Steve Wozniak apparently likes to wear pink but he sure as hell can't dance. Steve Wozniak called me -- from his iPhone, no less -- to clear up a little misunderstanding. The Apple cofounder and former Dancing With the Stars contestant hasn't abandoned his company's iconic smartphone for Google's new Nexus One. He's just giving the new device a try. "I always have the latest phones," said Wozniak. "It's pointless to say one's bad or one's better than the other." Last week, on the set of Class Action, an education show produced by NBC Bay Area, Wozniak told host Jessica Aguirre that his favorite gadget was "the latest one -- it's a non-Apple product, it's one that just came out yesterday," an apparent reference to Google's Nexus One. And sure enough, in an interview, Wozniak confirmed that he'd bought a Nexus One, as well as a Motorola Droid. Both run Google's Android operating system. But he still has plenty of Apple gear. "I have two iPhones, sometimes I wear a Droid on my belt, and also a Nexus One," said Wozniak. "At any given point, I might have BlackBerrys. My main phone is still an iPhone." Wozniak says he buys gadgets mainly so he can deal with questions from people who expect a cofounder of Apple to be up on all the latest devices. "I just do it so I'm a little knowledgeable about the products when people ask me," said Wozniak. "I really just want to be quiet, relaxed, a more normal person." But scratch the surface, and you'll find a serious geek who drives with four or more GPS devices -- two iPhones, a TomTom and a Garmin. It surely helps to be a billionaire when you've got that kind of gadget habit. "In my life, I must have been through a hundred different cell phones," said Wozniak. "That's a serious estimate. I got my first one in the '90s, from Motorola. At one point, I had a special VIP model that came in black and you couldn't get in the store." Wozniak doesn't love every phone out there. "I spent four months with my main phone being a BlackBerry," said Wozniak. "I didn't really like that much. I've had some Android phones, earlier ones, that sucked to me. The Droid and Nexus One are excellent phones, but that's not true of every Android phone." So what does he recommend people buy? Even though Wozniak's still on the Apple payroll, he said he doesn't like to push iPhones or Macs on people. "I don't like treating it like a religion," said Wozniak. " I don't like telling people that they're bad or wrong [for picking a particular device]. The right computer for you, based upon your family income and your type of work, might be a PC and not a Macintosh. I'd rather be a true salesman who cares about the customer -- though I try to bend them a bit of the way to the advantages of iPhones and Macintosh." To catch the rest of Wozniak's appearance on Class Action, watch NBC Bay Area on Sunday, January 24, at 3 p.m., or watch on nbcclassaction.com.